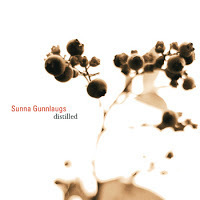 As anyone who’s heard Sunna Gunnlaugs’s previous trio album (Long Pair Bond) will already know, the Icelandic pianist’s penchant is for considered, carefully constructed music, skilfully calibrated to showcase the robust but subtle interactiveness of her trio, and to accommodate the eloquent soloing skills of all three participants. Drummer Scott McLemore and bassist ƥorgrímur Jónsson also contribute two compositions each to a wide-ranging programme embracing everything from the two Gunnlaugs openers (‘Momento’ and ‘Distilled’), which encapsulate the leader’s ‘love of moving harmony’, to outright free improvisation (‘Spin 6’ and ‘Spin 7’) and much more in between, including the bassists’s ‘Gallop’ (more a brisk trot, actually), the drummer’s pleasantly nervy ‘Switcheroo’ and – based on an Icelandic folk tune – ‘Things You Should Know’,. Gunnlaugs herself is a supremely tasteful pianist, her intelligent restraint slowly loosening in her solos to allow her to explore all the nooks and crannies of pieces such as her insistent closer, ‘Opposite Side’; McLemore is a brisk, confidently assertive drummer, his playing always tempered by delicacy and sensitivity, alert to every nuance of an absorbingly varied set; Jónsson is impressively responsive in his accompanying role and ear-catchingly melodic and lyrical as a solosit (highlight: a beautiful contribution to the title-track). Overall, this is a fresh and impeccably presented album from a strongly bonded trio brim-full of ideas.